Dunbar and Boardman: Who built the Falkirk Wheel? 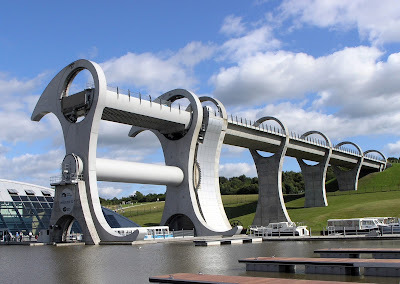 The Falkirk Wheel is the world’s only rotating boat lift and is used to connect the Forth & Clyde and Union canals in central Scotland. It was constructed between the years of 1999 and 2001 and then officially opened by Her Majesty Queen Elizabeth II on 24 May 2002 as part of her Golden Jubilee celebrations. The opening was the culmination of a planning, consultative and funding process that had lasted almost ten years. Ultimately the Falkirk Wheel came into being as a result of partial funding from the Millennium Commission and also other organisations including the British Waterways Board and the European Regional Development Fund. Who designed the Falkirk Wheel? There were a number of contributors to the design phases of the Falkirk Wheel. The final design is similar to a Celtic Double-headed Axe. It was a cooperative effort between the British Waterways Board, engineering consultants Arup, Butterley Engineering and a firm of architects called RMJM that was led by Tony Kettle. Together they created a unique boat lift that uses gravity and Archimedes’ principle. How Does the Falkik Wheel Work? The Falkirk Wheel was created to connect the two canals Forth & Clyde Canal and the Union Canal. Where the two meet there is a difference in height of 115 feet. In the 1930s the canals had been connected by a series of 11 locks. The Wheel is two balanced water tanks suspended on arms that rotate around a central axis. When the weight is balanced gravity takes down the descending arm and raises the ascending arm at the same time. Each tank can support up to four twenty-meter-long boats at one time. It takes around 4 minutes to complete a turn. The Wheel uses very little electricity only needing 1.5 kilowatt hours. You can see the Wheel in action ‘here’. The Wheel has become an established tourist attraction. More than 4 .4 million people have visited the Wheel since it opened in 2002 and 1.3 million have taken a boat trip on the Wheel. Around 400,000 people visit the wheel each year.